Waterfront Toronto and the City of Toronto are jointly undertaking a Municipal Class Environmental Assessment (EA) Study and Public Realm Concept for the Lower Yonge Precinct Area. The Lower Yonge Precinct Area includes approximately twelve hectares of waterfront land located between Yonge Street and Lower Jarvis Street, south of Lake Shore Boulevard East and north of Queens Quay East. 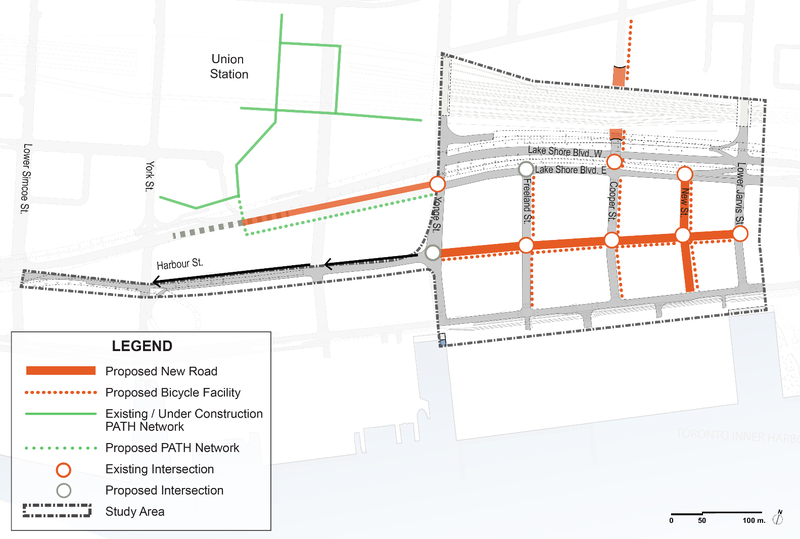 This study will also assess the configuration of Harbour Street as far west as Lower Simcoe Street. A Transportation Master Plan (TMP) was completed in 2015 that identified the transportation infrastructure required to support development within the Lower Yonge Precinct Area. The TMP addressed the requirements of Phases 1 and 2 of the Municipal Class EA. This project will fulfill Phases 3 and 4 requirements under Schedule ‘C’ of the Municipal Class EA process, which will define specific road alignments, lane configurations, the public realm concept and other technical aspects, such as integrating active transportation. An Environmental Study Report (ESR) will be prepared in accordance with the requirements of the Municipal Class EA, which is an approved planning process under the Environmental Assessment Act (1990). Public consultation is a key component of this study. The public are encouraged to provide input at any point during this study. A Public Information Centre (PIC) will be scheduled to provide all stakeholders, including residents, business owners, and members of the public, as well as relevant public and private agencies, with an opportunity to review, comment on and discuss this study. Further advertisements will be posted once the PIC date is scheduled.